We never thought we'd live to see the day that someone out-shoed Carrie Bradshaw. While the SATC character was notorious for her Manolo obsession, we imagine that Darlene Flynn of Romoland, California, doesn't play favorites. Only because when you've got over 16,000 options, picking a fave is probably more daunting than trying on Lady Gaga's heelless shoes. Trust, we've all been there: It feels like the only remedy for that broken heart is a new pair of fancy footwear. But, Flynn — who's been divorced for nearly a decade, has turned coping into a complete obsession. 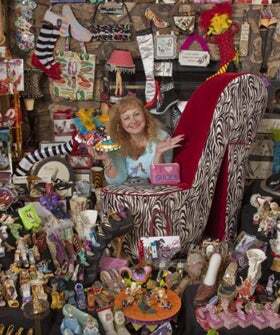 In 2006, she set the world record for the largest shoe-related collection with 7,765 pieces in her home. Now, she's back, and kicking it up a few notches! With $500,000 less in her bank account, Flynn now calls 16,400 heel-, sandal-, and sneaker-inspired items her own. From a cowboy boot toilet brush to stiletto salt and pepper shakers, nearly every square inch of her abode is adorned with some sort of pair paraphernalia, making Bradshaw's storied closet look like a mere drop in the bucket!